Being Frugal and Making It Work: Free Bath and Body Works Coupon - Free Lotion - No Purchase Necessary! Free Bath and Body Works Coupon - Free Lotion - No Purchase Necessary! Do you like lotion or know someone who does? 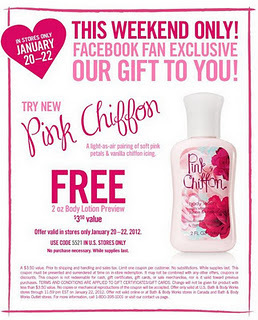 This weekend only you can get a free 2 oz bottle of Bath and Body Works newest fragrance Pink Chiffon body lotion. No purchase necessary. Get your free Bath and Body Works coupon here. This offer is valid from January 20 - 22, when you print the coupon on Facebook. Keep it for yourself, use it for Valentine's Day or save it for a stocking stuffer... the choice is up to you! Thank you Frugality is Free for sharing this Bath and Body Works coupon.